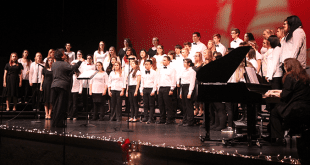 The Mena High School Choral Music Department will present their annual Christmas concert on Thursday, December 7, at 7:00 p.m. in the high school performing arts center. The program will feature the musical talents of the Sixth Grade Choir, Middle School Choir, Spotlight Singers, and the Bearcat Chorus. All choirs are under the direction of Ferroll “Tammy” Taylor.